Predictive-Based Asset Management is a reliability strategy that assesses the condition of equipment while in service to determine the appropriate remediation to improve system performance and reliability. Predictive-Based Asset Management has been utilized in electric generation facilities, aircraft maintenance, and industries for more than 25 years. The key value to Predictive-Based Asset Management (also called Predictive-Based Maintenance or PdM) is obtaining the "right information at the right time". Predictive-Based Asset Management monitors problematic conditions and provides utilities the opportunity to perform appropriate improvement operations to avoid equipment failure. In 2006, Exacter, Inc. introduced a new solution that provides a scalable system health assessment for overhead distribution and transmission systems allowing utilities to expand the use of Predictive-Based Asset Management from generation to all facets of the electric system. Exacter solutions follow a predictive process that utilizes patented radio frequency (RF) technology, proprietary analysis, and ultrasonic acoustic technology to detect problematic conditions (arcing, leaking, and tracking) present on overhead systems. Conditions are analyzed and discriminated against the Exacter Failure Signature Library™ to pinpoint the location and components responsible for the problematic conditions, providing utilities with advanced intelligence forPredictive-Based Asset Management operations. Overlaying GIS asset and connectivity data with Exacter system assessment data provides utilities a criticality measure that identifies the number of customers that would be impacted by an equipment failure. The criticality measure provides utilities the opportunity to priotiize maintenance operations based on the impact to system performance and reliability. Engaging Exacter on a predictive reliability project can be a turnkey operation. 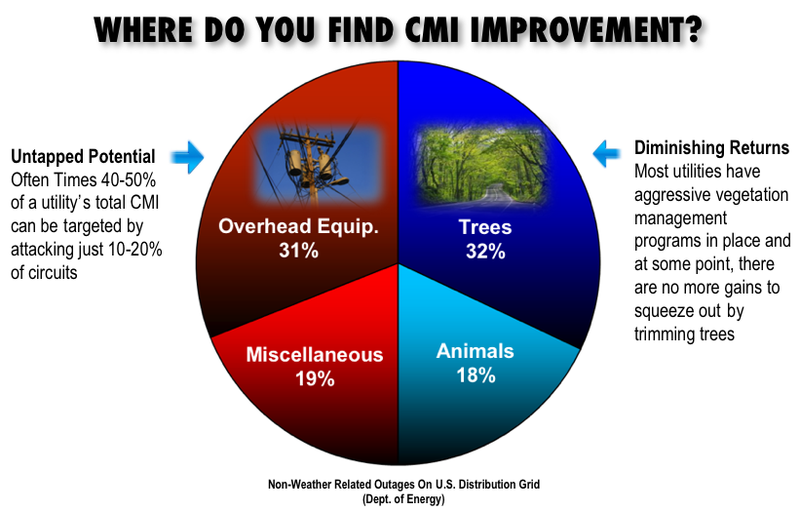 Once CMI and circuit data is received, Exacter provides the analysis, circuit targets, and projected impact for the project during the pre-survey stage. Then circuits are surveyed and problematic conditions and locations are investigated and pinpointed by Exacter field locating teams. Final reports are submitted including photographs of deteriorating equipment, pole numbers, GPS location – with all data made available in GIS compatible formats. Download Presentations from "Improving Grid Resiliency & Exploring Predictive Reliability Methods"
Exacter Application Story Published in T&D World Magazine!